For those who don’t know, Turnitin is automated plagiarism detection software that scans submitted documents and looks to see if there are matches to text found inside its databases. And, it should be noted, Turnitin’s databases are large. It’s a great tool, although it can be pricey to access, because you use it as a verification and detection tool, the obvious use, and as a teaching tool, where students submit their own work to see how much cut-and-paste and unattributed work they have included. Taking the latter approach allows students to improve their work and then you can get them to submit their work AND their Turnitin report for the final submission. This makes the student an active participant in their own development – a very good thing. I’m on the Turnitin mailing list so I receive regular updates and the one that came through today had a really nice graphic that I’m going to share here today, although I note that it is associated with the Turnitin webcast “Why Students Plagiarize?” by Jason Stephens. 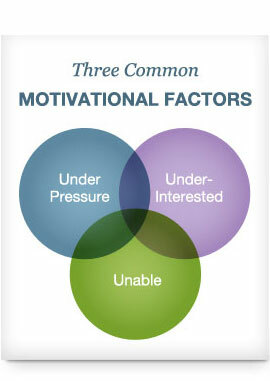 Here, he summarises the three common motivational factors. If a student isn’t engaged, they won’t take the work seriously and they won’t really care about allocating enough time to do it – or to do it properly. Worse, if the assignment is seen (fairly or not) as make work or if the educator is seen to be under-interested, then the lack of value associated with the assignment may allow some students to rationalise a decision to grab someone else’s work, put a quick gloss on it and then hand it up. No interest, no engagement, no pride – no worth. Students have to be shown that the work is valuable and that we are interested – which means that we have to be interested and the work has to be worthwhile doing! Students tend to allocate their effort based on proximity of deadlines. Wait, let me correct that. People tend to allocate their effort based on proximity of deadlines. Given that students are not yet mature in many of their professional skills, their ability to estimate how long a task will take is also not guaranteed to be mature. As a result, many of our students are under a cascade of time pressures. This is never a justification for plagiarism but it is often the foundation of a rationalisation for plagiarism. “I’m in a hurry and I really need to get this done so I’ll take shortcuts.” Training students to improve their time management and encouragement to start and submit work early are the best ways to help fight this, in conjunction with plagiarism awareness. Students who don’t have the skills can’t do the work themselves. To complete assignments without having the understanding yourself, you have to use the work of other people. For us, this means that we have to quickly identify when students don’t have the knowledge to proceed and try to remedy it, while still maintaining out academic standards and keeping our pass bars form and at the right level. Sometimes this is just a perception, rather than the truth, and guidance and encouragement can help. Sometimes we need remedial work, pre-testing and hurdles to make sure that students are at the right level to proceed. It’s a complex juggling act that forms the basis of what we do – catering to everyone across the range of abilities. The main reason that I like this diagram so much is that it doesn’t say anything about where the student comes from, or who they are, it talks about the characteristics that are common to most students who plagiarise. Let’s give up the demonisation and work on the problems. A strategy one of my lecturers used to help us with time management was handing up work in sections. We had been assigned a huge project at the beginning of the semester with a due date at the end of the semester. He had due dates for particular sections sprinkled throughout the term just to make sure we started and were working on our projects and not just leaving them to the last minute. It’s a strategy I hope to use in the future because from a student perspective it really helped me manage my time and from a lecturer perspective you can monitor and give feedback before it’s too late. And as you have rightly put it, you can weed out plagiarism from early on. Another great article… thanks! It’s a good strategy. Giving students a framework to help with their time management, to prevent the last minute panic, is a tool that we often overlook, despite its simplicity and efficacy. Thanks, Angie!